In the past five trading days, the initial uptrend in telecom stocks was eventually replaced by a steep decline as various telecom firms faced the heat from the freshly imposed U.S. tariffs on $200 billion worth of imports from China. Although bullish economic sentiments fuelled by increased job creation, lower taxes and upbeat wage rates tried to soothe investor nerves, the toll on essential household items and telecom products that power the Internet, mobile networks and data storage affected investor confidence. The Trump administration has levied tariffs on 5,745 imported goods from China from the beginning of this week. The tariffs will be initially imposed at 10% and will be subsequently increased to 25% from 2019. In retaliation, China has also imposed tariffs on $60 billion worth of U.S. goods, which include 10% levies on 3,571 items and 5% on another 1,636 products. The telecom sector has long outsourced production to low-cost countries like China, where manufacturing and assembly of products is relatively cheaper than in the United States. With increased tariffs in place, the move is likely to be counter-productive and domestic consumers are expected to face higher product costs as firms increasingly pass on the costs to avoid margin pressures. Amid such cacophony, President Trump inked a new directive to give shape to the country’s new cyber strategy that broadly identifies Russia, China, Iran and North Korea as its main rivals. The strategy hinges on four key elements, namely protection of the American people, homeland and way of life; promotion of U.S. prosperity; preservation of “peace through strength” and increasing its overall influence on the Internet. It forms an integral part of the overall deterrence policy of the country that includes pre-emptive launch of cyber-attacks against any nation or actors sponsored by a nation in order to thwart any such potential attack. Regarding company-specific news, product launches, strategic deals, legal battles and technological collaborations took the center stage over the past five trading days. 1. AT&T Inc. T has collaborated with Harman International to give shape to the connected car concept on any existing model manufactured after 1996. The strategic deal would help AT&T to fuel business transformation through edge-to-edge capabilities in order to accommodate the evolving consumer needs. 2. Juniper Networks, Inc. JNPR announced that TIME dotCom Berhad has used its vSRX solution for rolling out the latter’s latest suite of virtual managed services for enterprise customers across Malaysia. TIME dotCom Berhad is a Malaysia-based communications solutions provider. 3. In the latest twist to a prolonged legal battle between QUALCOMM Incorporated QCOM and Apple Inc., the former alleged that the latter has stolen its trade secrets related to chip-making software for the benefit of a third-party service provider. The fresh charges against the iPhone maker will likely make the legal battle murkier and further embroil the patent dispute into a long-drawn judicial process. 4. United States Cellular Corporation USM recently announced that it has partnered with Internet of Things America LLC or IoT America to provide an advanced suite of IoT solutions for enterprise customers and rural communities across the nation. Notably, IoT America leverages IoT to increase productivity and yield, minimize costs, save scarce resources and improve the quality of life in rural America. 5. Harris Corporation HRS has announced that as part of the U.S. Army’s two-channel Leader radio indefinite delivery/indefinite quantity contract, it has secured orders for 1,540 AN/PRC-163 two-channel handheld radios & related equipment and services. The AN/PRC-163 is the most advanced software-defined handheld radio in the world today, providing warfighters and commanders with unprecedented capabilities like enhanced levels of command & control and situational awareness. In the past five trading days, Motorola Solutions, Inc. MSI was the major gainer with its share price increasing 3.3%. Qualcomm was the major decliner with its stock losing 3.2%. 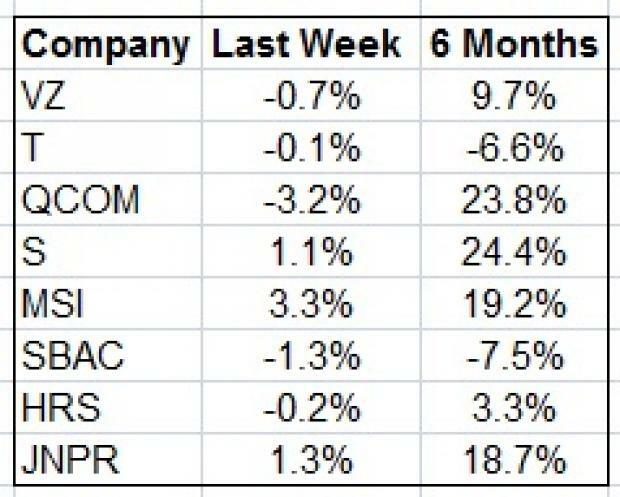 Over the past six months, Sprint Corporation S was the best performer with its stock appreciating 24.4%, while SBA Communications Corporation SBAC declined the most with its shares falling 7.5%. Over the past six months, the Zacks Telecommunications Services industry has recorded an average return of 1.2% while the benchmark S&P 500 Index has gained 12.2%. In addition to continued product launches and deployment of 5G technologies, all eyes will remain glued to how the industry fares against the continued toll of tariffs.